Our dental practice is committed to excellence. We believe in providing you with high quality esthetic dental services while giving you the personal attention that you deserve. We offer a wide range of family and cosmetic dental services using a gentle touch with modern techniques and technology. Your comfort is a top priority, which is why we also offer sedation dentistry. Our highly trained team spends time with our patients to get to know them as people first to make sure the care we provide fits their individual wants and needs. If you are looking for advanced dental care for your entire family, please contact Exceptional Dentistry online or by calling 563-556-2711 today to schedule your consultation with Dr. Ted Murray, Dr. Kristen Berning, or Dr. Alexia Oetken. A beautiful smile is always in style. Our doctors are among the very best when it comes to giving you a smile of your dreams. We have a special interest in cosmetic dentistry, with advanced training and credentials to make our office the right choice for you. Dr. Ted Murray is an AACD accredited dentist, which puts him in an elite group of cosmetic dentists worldwide. Cosmetic Dentistry cases completed in our office can be viewed in our Smile Gallery. At our office, your comfort is very important to us. Sedation dentistry is a safe, effective treatment for people who have been avoiding the dentist for years – even decades – out of fear and anxiety. We take dental fear seriously and are dedicated to providing an experience that will lessen dental anxiety and give you a healthy smile. Oral sedation and IV sedation allow Dr. Ted Murray to complete many dental procedures in one visit. A sedated patient will have little to no memory of the appointment. All of our services are customized to meet your individual needs and goals. From the moment you walk through the doors of our state of the art building, you will sense the comfortable atmosphere and our top-notch commitment to providing you with an exceptional experience. We love what we do and we take pride in providing the highest quality dental care. 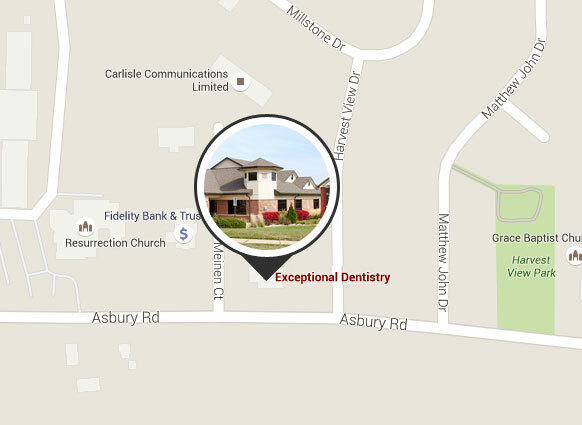 Whether you’re looking for a smile makeover or just a routine checkup, Exceptional Dentistry is able to meet your needs. If you are interested in scheduling a consultation or learning more about Exceptional Dentistry, please call our office at 563-556-2711 or contact us online. Drs. Ted Murray, Kristen Berning, and Alexia Oetken provide care for patients in Dubuque, IA and the surrounding areas. "While it may seem odd to some, I actually enjoy my dental checkups. Everyone always greet me with a smile and a friendly hello by name. Making the switch to Exceptional Dentistry 5 years ago was the best decision I made for our dental health. We've learned a lot and have put it to use. Dr. Berning is a true artist and I have a smile to prove it! Thank you all."